Last Sunday, Saidbek (Corny’s old landlord and the guy who helped us find our current house) took Shane and I out on an excursion to the countryside north of Dushanbe. Countryside is a bit of a misnomer, for it recalls, to me, softly rolling hills or well-tended fields. As we took the road out of town, we headed instead up into the craggy mountains that surround the city. 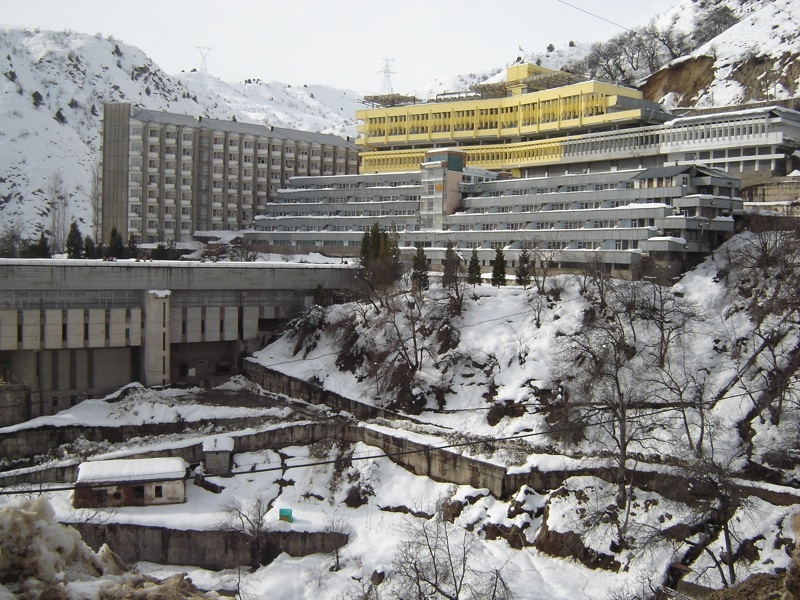 I knew we were going to some sort of resort, but I became increasingly dubious as we drove through the resort town of Varzob, where the Tajik president has one of his many dachas, and continued on. Eventually, about an hour north of Dushanbe, we took a left. With my basic Cyrillic reading skills, I deciphered that the sign said we were several kilometers from “Khoja Obi-garm.” I had heard of the Obi-Garm to the east of Dushanbe, which is the playground, in a manner of speaking, for many of the governmental elite. And I knew that the phrase “obi garm” meant “hot water” in Tajik. But I had never heard of this place. Immediately I was reminded of the Soviet-era monstrosity that looms over the otherwise elegant spa town of Karlovy Vary in the Czech Republic, which I visited with both my schoolmates and my folks. Unlike that brutalist structure, however, the one in Khoja Obi-garm had telling Tajik touches: the lack of electricity, indents that showed where furniture had been pilfered, and, of course, the facade painted a vigorous yellow. Perhaps the most telling touch is the last, as the yellow stops halfway across the front of the building. When you get close, you can see that, for no apparent reason, they just stopped painting; you can even see the individual brush strokes where they stopped. Maybe they ran out of paint, or money to pay the painters. Maybe they just got bored. Who knows? And who knows how long it is has been, or will be, like that. While the tour of the hotel (600 somoni, or about $136, for a 12 night stay, three squares a day included) was somewhat amusing, and the lunch avoided catastrophe (which can sometimes be a minor miracle), the true highlight was when we took the waters at Khoja Obi-garm. People, apparently, have been coming to the spring there for years, even before a hotel was constructed for tired proletarians from the city, to bathe in radon-infused water and breath in radon-infused steam. Yes, radon is radioactive. So there’s that. But it is also, perhaps relatedly, good for your aching bones; in particular, radon spas have been used to treat arthritis. Shane shares his take on our experience in the steam bath on his blog. I enjoyed it a bit more than he, I think, buried under clouds of radon steam and dunked in radon water that seemed on the verge of boiling at any second. For someone who has heat regulation issues, I do like a schvitz. After a longish lay in the recuperation room, and fortified by several cups of mint tea, we headed back to Dushanbe calm and content. I managed to maintain the zen as I dozed in the back of the Niva; Shane had to drive. Before December runs out, I should probably do my Hanukkah post, right? For the first time in a long time, I lit all the candles and said all the prayers for Hanukkah. This is after years of dragging around menorahs and boxes of Hanukkah candles from house to house and not doing it. 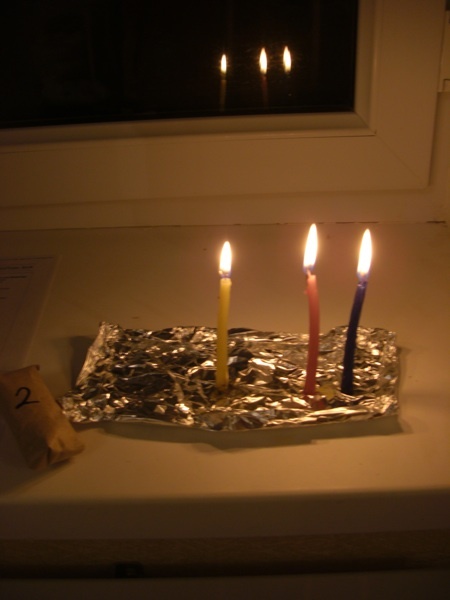 So, sans menorah, unless you count a craggy piece of aluminum as such, candles warped from years of disuse, and a print-out of the blessings, I plunged forward. There was something poignant about “doing Hanukkah” in a town where the only synagogue had been razed recently to make room for an ill-planned, unnecessary presidential palace. Hearing the old words of my childhood in the prayers, sung to a half-forgotten tune, and then tearing into the presents so thoughtfully provided by Pangie — one for each night, first night I got a pack of Orbit, and the second night’s present is shown, wrapped, above — it was a bit of home, a bit of heritage for me in far off Tajikistan. Can’t say that this led to a “personal relationship with God” as the fundy commercial goes, but I’m glad I did it. 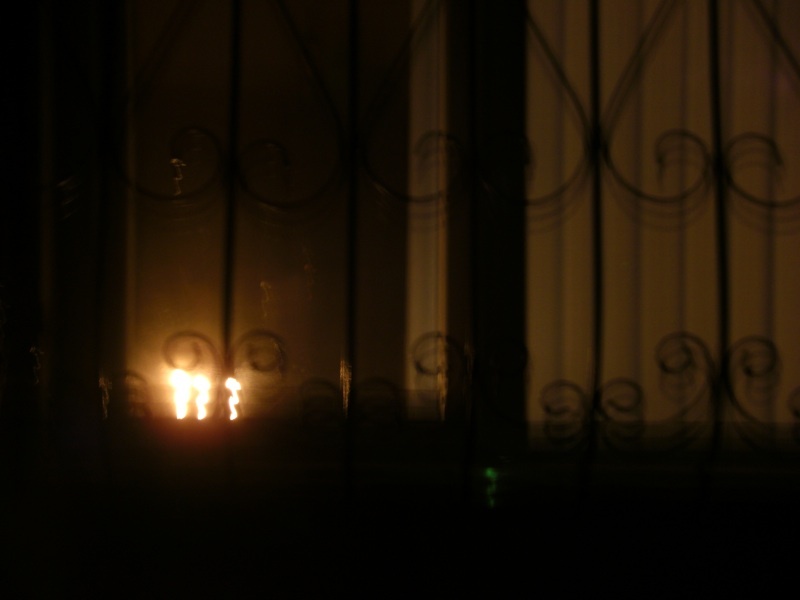 Tribal blood and identity dies hard, and it struck a cord to see the Hanukkah candles in my window here, a place where these candles were lit for 2,000 years, but perhaps not for too many more with the Bukharan Jews mostly residing in Israel and Queens nowadays. You ask, and the internet delivers. A very special thank you to C.B. who prompted her IFC colleague in Minsk to take a look at this blog. It is starting to get a bit chilly here, with temperatures in the 30’s for the past several days. 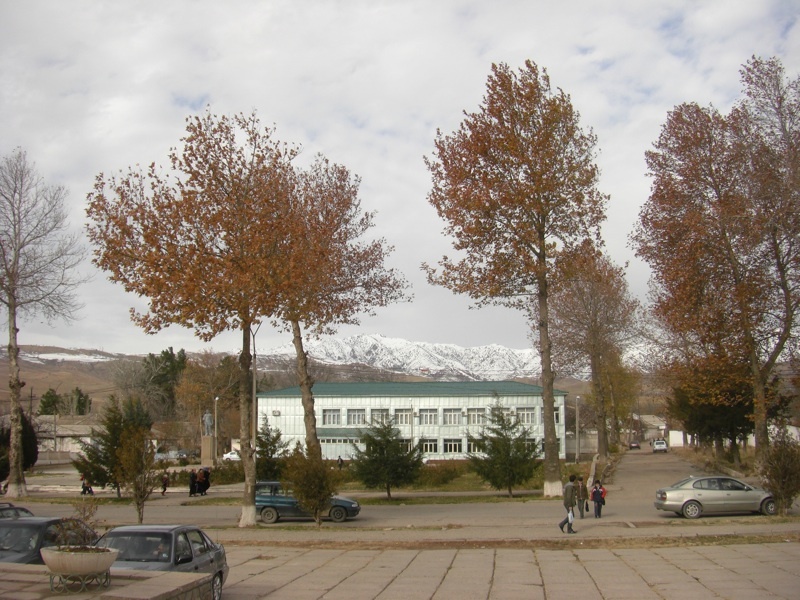 We even had a bit of snow in Dushanbe last week, although it didn’t stick. But in the countryside, even relatively close to the city, it feels much colder. The photo above is from Faizabad, about 60 km east of Dushanbe, and you can almost feel the chill seep out of the screen. I can take it, seven years in Ithaca made sure of that, and I have modern conveniences like a heater in my bedroom. The people in Faizabad don’t have such conveniences, by and large. Hell, a fair number of people in that district don’t have running water. And even if they did have all the amenities, the government hasn’t turned on the heat yet this year. For anyone. Thanks Uzbekistan! Thanks misplaced priorities! This could be a long winter. Not for me; I can check into the Hyatt if worse comes to worst. The people of Faizabad can’t. Once you pop, you can’t stop. Yes, it’s a Pringles ad, but it also is true for blog stats. So indulge me for a bit more navel gazing. 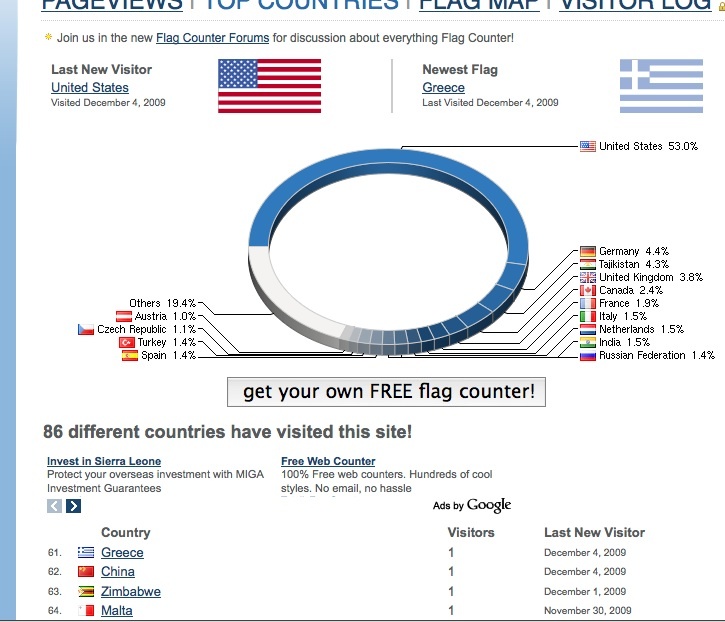 Shortly after my plea for a site visit, Greece, or one random Greek dude, stepped up and visited this blog. Where have you gone, Belarus (the ancestral home of my paternal side’s maternal side)? I turn my lonely eyes to you. BTW, the postcard offer for Greeks and Belarusians still stands: leave a comment on here and subsequently e-mail me your address, and I’ll send you a postcard from lovely Dushanbe. Meanwhile, I’ll put up some more interesting stuff soon. 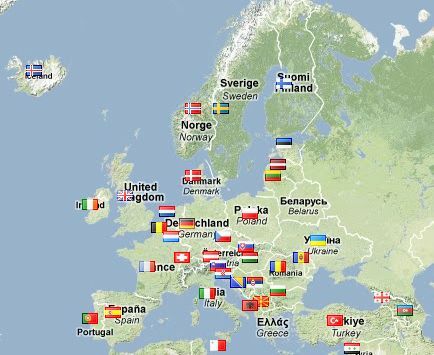 Navel gazing, or where are you Greece and Belarus? So, due to the vagaries of the Internets and perhaps due to my compelling photos of hot dogs, web surfers from almost every significant country in Europe, as well as some of the small ones (looking at you Montenegro), have viewed this blog. The two major laggards: Greece and Belarus. Because I know you care, I will periodically keep you informed as to whether anyone from the sun-drenched Hellas or sleeting White Russia has visited this site. To the first visitor from either or both of those countries who posts a comment here and subsequently e-mails me their address, I promise to send them a postcard from lovely Dushanbe. Tajik Post might lose it, but I promise to mail it. In related news, thanks to the people behind our 17 unique visits from Latvia, the most, by far, on a per capita basis for any country. I haven’t been there since 1994, unless you count three recent layovers in Riga airport, but if the Latvian love keeps coming, that may have to change. Time: 1:35 p.m. Place: Dushanbe city, Shah Mansour district. Cost: 6 somoni (approximately $1.45). There’s something special about a Tajik-style hot dog. It isn’t the dog itself, which is a garden variety turkey dog that’s been steamed. And while the bun is okay, and certainly better than many American buns (though not reaching the heights of awesomeness of a New England-style hot dog bun), it’s nothing to write home (or on a blog) about. Rather, it is the sauce, or I should say, the sauces — for a Tajik dog invariably is topped with both a weirdly spicy ketchup and a weirdly watery mayonnaise — and the shredded carrots that make it something different and cool. Okay, cool may be too strong, but it definitely different and it is pretty tasty too. That my Tajik-style hot dog was accompanied by an RC cola and some bizarre chicken-flavored salty, crispy snack, just brings the meal up a notch. Add to this that the total cost was significantly under two dollars, and you can see why this meal just may be one of the things I miss the most about Tajikistan when I leave. This and the mountains and the expats and the tree-lined streets and the odd happenstances. But the Tajik dog is up there. An apology: my posting here has been dilatory. Expect it to improve. In case you were wondering, things in TJ are great and November was a terrific month for me, so nothing bad was keeping me from this blog. Just being busy and being lazy in roughly equal measure.